bebopified: Should Jessye Norman still be singing? A lot of people probably asked that question before, during, and after Jessye Norman’s performance at the Ordway on Tuesday. Maybe not out loud, and maybe not in those words, but it was in the air. Norman was here for a special concert celebrating the 130th anniversary of the Schubert Club, one of the nation’s oldest arts organizations. Its flagship program is the International Artist Series, an annual offering of recitals by high-end performers, the cream of the classical world, great artists in their prime or rising fast. People like Anne-Sophie Mutter, Itzhak Perlman, Joshua Bell, Renée Fleming, Susan Graham, Bryn Terfel, Stephen Hough, and Yo-Yo Ma. Norman has appeared in this series three times, but Tuesday's concert did not sell out. Comments made during intermission, and later in reviews and responses to emails, were respectful but tinged with disappointment. After all, she’s 67 years old. Her voice isn't what it used to be. Sometimes she was hard to hear. Maybe she shouldn’t have attempted some of those ornaments. The high notes seemed out of reach. She had control issues. Her dynamics were imperfect and strained. She doesn’t have the gale-force power or the amplitude of her Wagnerian days. All true. But she didn’t sing opera at the Ordway. She sang songs from musicals; songs made famous by Nina Simone, Lena Horne, Odetta, and Ella Fitzgerald; songs by Duke Ellington. Which presents another question: Should opera singers sing popular songs? That depends. Placido Domingo recently released his “first official pop album in nearly 20 years,” an album called “Songs” on the Sony Classical label. I love Domingo’s voice – and at 72, he still wins leading roles on the world’s opera stages. (In March he sang “La Traviata” at the Met, in April “Nabucco” at the Royal Opera House in London.) But “Songs” is dreadful. It includes many pairings that should not have happened: Domingo with Harry Connick Jr. for “Time After Time,” Domingo with Broadway’s Megan Hilty (Glinda in “Wicked”) for “My Heart Will Go On” from “Titanic” (oy), and collaborations with Susan Boyle, Josh Groban, and Welsh crossover singer Katherine Jenkins (“Come What May” from “Moulin Rouge”). Shades of Sarah Brightman and Andrea Boccelli! Everybody’s performance is perfectly fine; they just don’t belong together. On stage at the Ordway, Norman was paired only with her pianist, the sensitive and supportive Mark Markham. As it happens, several of the songs we heard are also on her latest album, “Roots: My Life, My Song,” released in 2010 as “her first solo album in more than 10 years.” Is she becoming a jazz singer? She’s singing jazz songs. She swings. She even scats. She has toured with a program called “The Diva and the Duke.” The year "Roots: My Life, My Song" came out, she opened the Montreux Jazz Festival. At times on “Roots,” we hear flashes of the diva, the dramatic soprano who sang Sieglinde. We heard them in concert. She retains her bottomless resonance, impeccable diction, silken vibrato, and regal demeanor. But she’s using them in new ways. And while she may not have her old fortissimo, her pianissimo – a weapon of stealth and gossamer delicacy – hooks you like a helpless fish and pulls you in. And even though her high notes aren't perfect anymore, her contralto is smoky and nuanced. 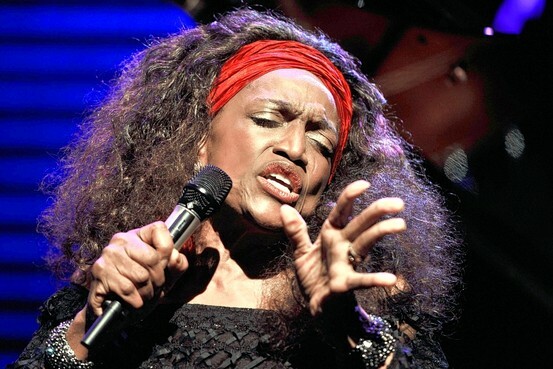 Since Jessye Norman is singing differently, perhaps we should listen differently. Maybe instead of lamenting the loss of a celebrated opera singer, we should greet the arrival of a seasoned interpretive singer. Let's be happy she’s still singing. Let’s not write her off quite yet. Let's see where she goes without tugging at the hem of her robe (which, on Tuesday, was a glorious statement in black-and-white, printed all over with magnolias). I’m thinking of a night in October, 2005, when I heard Jimmy Scott sing. He was 80 then, and he’d had a hard life. He was very frail, and many people remarked that his voice wasn’t what it used to be. But what it was I’ll never forget. He sang with so much emotion that I almost couldn’t breathe. “Why not take all of me?” “Sometimes I feel like a motherless child.” “I cried for you, now it’s your turn to cry over me.” I cried, Jimmy. For you, for me, for all of us. Placido Domingo is singing sticky, gooey movie songs. José Carreras just performed two arena concerts in Taiwan with 13-year-old Jackie Evancho, the PBS pledge drive sensation. Kiri Te Kanawa is about to guest star on “Downton Abbey.” If Jessye Norman wants to sing Duke’s “It Don’t Mean a Thing” or “Don’t Get Around Much Anymore,” or take on the darkness and despair of “Another Man Done Gone,” made famous by Odetta, then please, Miss Norman, come sit by me. I'm happy to credit the photograph, and request permission to use it, if someone can tell me who took it. Great Great Article! Personoally i think it was written with the respect and honor ms Norman deserves. I love everything abot Ms. Norman. I totally agree, thank you for your review. I saw Ms. Norman this evening and loved every minute. SIMPLY WONDERFULLY STATED! Thank you! Thank you!